Dwayne Leverock, Bermuda's most recognisable player, has hung up his boots after the side lost their ODI status and failed to qualify for the 2011 World Cup. "I can always hold my head up and know that I gave Bemuda everything I have," Leverock said after the win over Uganda which secured Bermuda ninth place in the ICC World Cup Qualifiers. "I'm speechless right now. I shed a few tears early this morning and late on after the game when we won. It's hard for me. This is what I love to do. It's all in my heart, but this is the right time. "There comes a time in your career when you need to take a step back. You've given all you can and your body sometimes tells you, with the aches and pains after games, that it is time to slow down. Even though my heart is still in it, the body says slow down. "It is time to take a backseat especially with the youngsters coming through. I want to try to give them an opportunity to play and maybe I can spend some more time with my daughter. I haven't seen her as much as I would have liked to over the last four or five years." Although the unlikeliest looking sportsman, his bulk has often overshadowed his undoubted ability with the ball and he has repeatedly been Bermuda's most consistent bowler in both limited-over and first-class cricket. 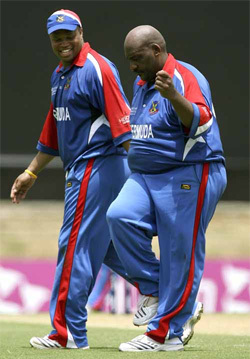 While his batting was poor and fielding less than agile, his weight was no barrier to him bowling lengthy spells and he missed very few games. He will, inevitably, be best remembered for his diving slip catch against India at the 2007 World Cup and the remarkable and earth-shattering victory sprint which followed. "It has meant so much to me to have people recognize me for who I am as an athlete," he told the Bermuda Sun. "Some people say it is just your size but people look past that, you know. Walking through airports people recognise you, going through different countries people recognise you and talk about the World Cup and my achievements in the Intercontinental. I always have time for youngsters. It's a nice feeling to sign autographs and give them advice on their cricket." He is not likely to be lost to the game altogether as he has plans to go into coaching and is aiming to get the necessary qualifications to help the next generation come through. "I know the level that I've been playing at and I know some of these youngsters can get to that level. It's very important for me to help this programme go further. I was given the opportunity, now it is time for others to get their chance." In 32 ODIs he took 34 wickets at 33.02 with an economy rate of 4.00, and in 15 first-class outings he captured 71 wickets at 26.47.